You will be given a reference e-book to read which has 388 pages And the test will be based on that e-book , you can take final test within 1 year of purchase. Management is a broad subject but its most common definition states that it is a process of gathering people together with an aim of accomplishing desired objectives and goals by efficiently and effectively utilizing the available resources. The entire process actually involves organizing, leading, planning and staffing an organization or effort to accomplish both short-term and long-term goals. Among the many resources that can be used in effective management are human resources, technological resources, natural resources and financial resources. Management also refers to human action which includes design and aims to facilitate the process of producing remarkable outcomes and results from using a system. It also refers to the process of organizing and coordinating activities within an enterprise without violating any set standards and policies. Management can also be defined as one of the most essential factors of production along with materials, money and machine. It also performs two basic tasks namely innovation and marketing. Most of the time, the management and decision-making processes are usually carried out by the managers and directors of an organization. Management is also composed of all the interlocking functions needed in the formulation of corporate policies. It should also be noted that the size of a management department differs on the number of people required to fill it. For small firms, the management process can already be successfully carried out by a single professional. Large firms and multinational companies, however, require hundreds or thousands of management professionals. 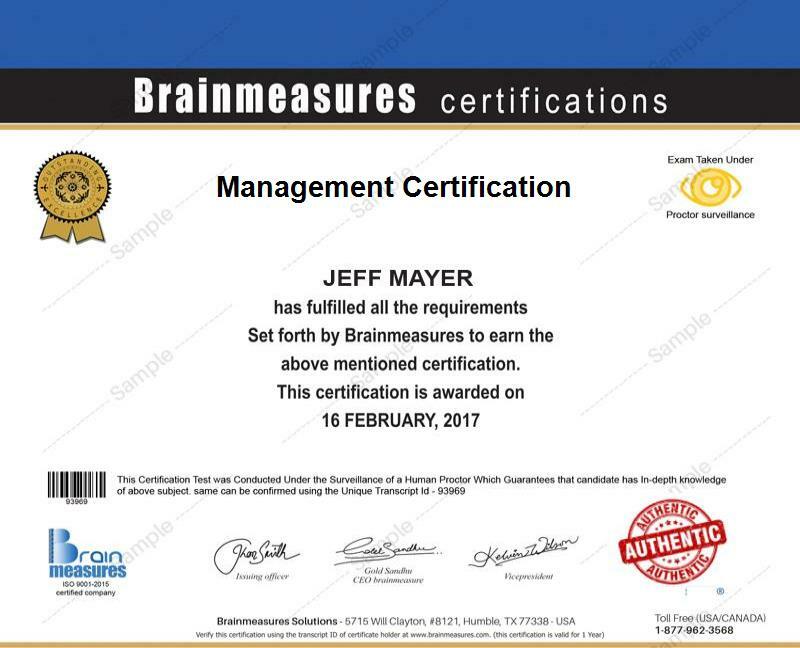 Becoming a certified manager is no longer that hard especially if you decide to enroll in the management certification course offered by Brainmeasures to the public. As a reputable online certification company, Brainmeasures can be expected to work effectively in providing you the most detailed management training while also ensuring that your skills in management are honed. By enrolling in the management course offered by Brainmeasures, you become more aware about the things that you can do to successfully and effectively carry out the management process. You will become more familiar about the procedures involved in delegating responsibilities to all your employees and in making sure that all your decisions are in favor of the organization which you are working for. One of the major challenges of the online manager certification course from Brainmeasures is passing the online management exam which comes along with the program but rest assured that you can easily handle it if you just commit yourself to learning everything about management. The reward of passing the online management test is your management certificate. Proper management plays a vital role in the success of an organization so it is safe to assume that the management certification program especially that which is offered by Brainmeasures can benefit almost all types of people and professionals. The certification course is extremely beneficial for team leaders, non-managers, supervisors, first time managers, front line managers, senior managers and middle managers. Because of the many positions that you can fill after receiving your management certification, you also get the chance to receive a higher pay once you get a managerial position in an organization. The average annual salary that you can get after becoming a certified management expert is $86,000 with a possibility of growth in the near future.